Update, October 4: Batman: The Enemy Within Episode 2 – The Pact is available now. Clown Prince versus Dark Knight. 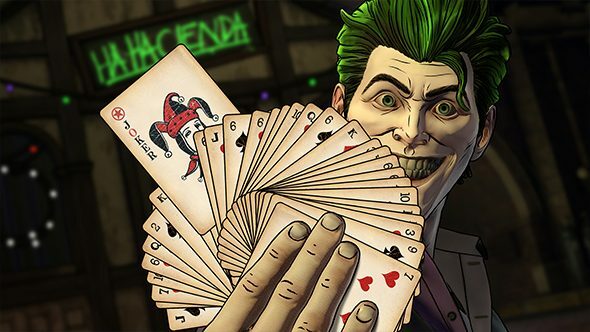 It’s one of the most iconic conflicts of nerdy mythology, and Telltale’s Batman: The Enemy Within aims to explore the origins of the Caped Crusader’s biggest villains. Episode Two, titled The Pact, is out now. This episode got announced at Gamescom – check out the announcements you missed here. John Doe, who is definitely not (yet) the Joker, has a bunch of nasty friends on the loose, and it seems Batman will be coming face-to-face with Harley Quinn over the course of this episode. The end of the trailer also teases an appearance from Bane, which should prove a backbreaking introduction. Original Story, August 22: It seems like the story of Batman and the Jok- sorry, John Doe, definitely not the Joker, is moving pretty quickly, as episode two of Batman: The Enemy Within is coming out in just over a month, on September 26. It’s called The Pact and focuses on a brand new character to the series. This episode’s a bit more relevant to Batman and the Joker than the Riddler in the last episode as it introduces Harley Quinn. It focuses on her relationships with both Batman and the Joker, presumably leading to her fascination with the latter. It’s not entirely the Harley Quinn you know, though, as this interpretation will be “framing her in a new way” while retaining much of her aesthetic and themes. You can get a glimpse of the first still of Harley Quinn above – even before John Doe has adopted the persona of the Joker, she looks to be a bit of a baddie. Perhaps some sort of crime lord given the wads of cash on her desk. There’s no trailer for this episode yet, so you can probably expect that closer to the episode’s release date. Episode one is already out – you can play that (and buy the full season) on Steam.